Route 63 serves as an additional offer of elective courses for the Master programme "Software Engineering and Management". You can choose one or more of three topics - Digital Entrepreneurship, Cognition & Behaviour and Current Societies - that will then replace the existing "Management" catalogue worth 21-33 ECTS. Once you have obtained at least 15 ECTS from one Route 63 topic, you will receive a special Route 63 certificate in addition to your Master certificate. 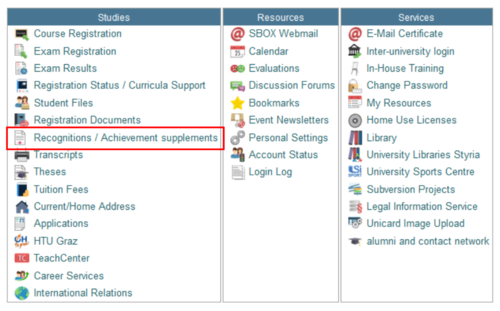 To transfer credits from Uni Graz to TU Graz, please enter your certificates from Uni Graz in TUGonline under Achievement supplements > New achievement (see picture).